What is a principal? an agent? an independent contractor? What factors do the courts apply in determining whether a worker should be classified as an employee or an independent contractor? Why is this classification significant? How is an agency relationship created? 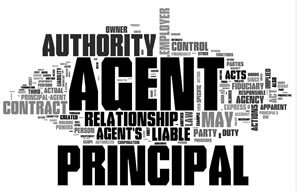 What duties does a principal owe an agent? What fiduciary duties does the agent owe the principal? When is an agent liable for the contracts he negotiated on behalf of the principal? What is the difference between a fully disclosed, partially disclosed, and undisclosed agency? What is the significance of this distinction? What happens if the agent exceeds his authority? When is a principal liable for the negligent torts committed by an agent? What is a frolic and detour? a dual purpose mission? When might a principal be liable for torts committed by an agent on the way to work or the way home under the "coming and going" rule? When is a principal liable for the intentional torts of an agent? When can a principal be held liable for the torts of an independent contractor? How is an agency relationship terminated?